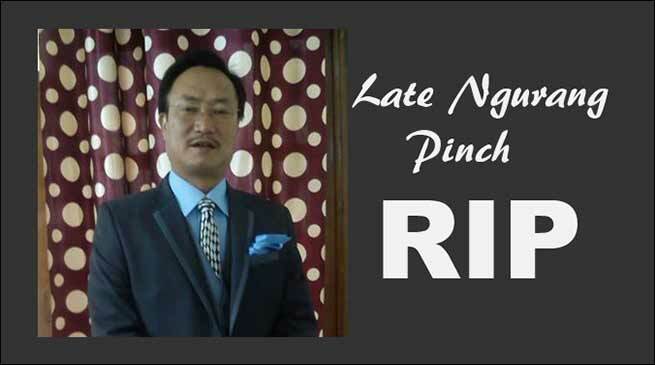 Deputy Chief Minister, Chowna Mein expressed deep shocked and sorrow on the sudden and tragic demise of Ngurang Pinch, former legislator and the Chairman of the Arunachal Pradesh Agriculture Marketing Board. In his condolence message, Mein said that he worked in close coordination with Pinch as a team in connection with the betterment of Arunachal Pradesh Agriculture Marketing Board. He said that Pinch was an upright person who was always working for the upliftment of farming community of the State. In him, we have lost a good human being and a dedicated social worker, Mein added. Pinch was elected to the fourth Legislative Assembly in the year 2004 from 14th Doimukh Assembly Constituency and served as Member of Rules Committee and Departmentally Related Standing Committee on PWD, PR, etc. and also as Chairman, Advisory Council for Sports & Youth Affairs. Mein conveyed his heartfelt condolence to his family members and prayed for the eternal peace of the departed soul. He also prayed to Almighty God to bestow enough strength to the bereaved family members to enable them to bear the irreparable loss.